TeikyoSat-3 is built to take images in space of the growth process of slime mold, dictyostelium discoideum. It's not quite the slimy creatures from the movie "Ghostbusters," but it's close. University students in Japan are building a slime-mold–housing micro-satellite that will orbit the Earth and send back photos of the creature's growth. The small satellite will transmit the pictures to Earth using amateur radio. TeikyoSat-3 weighs 44 pounds (20 kilograms) and is designed to study the impact of space radiation and the microgravity environment on a mold called Dictyostelium discoideum. 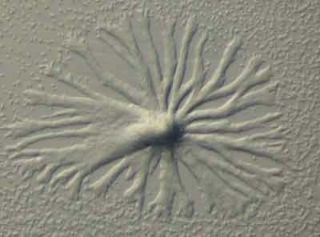 This species of soil-living amoeba belongs to the phylum Mycetozoa and is often given the less than high-brow biological label of "slime mold." Fungi growth on the International Space Station, observed on a panel where post-exercise clothing was hung to dry. The life cycle of D. discoideum is relatively short, which allows for timely viewing of all the stages of its life. The GPM spacecraft was jointly developed by JAXA and NASA as part of an international network of satellites that provide next-generation global observations of rain and snow. Russia's Mir space station was found to be home for mold growth. During its 15 years of space travel, which ended in March 2001 with its deorbiting, Russia's Mir space station was found to house colonies of organisms. They were found alive and well, and growing on places like rubber gaskets around windows, on space suit hardware and on cable insulations and tubing. More recently, officials from NASA's Human Research Program plan to gather and analyze biological samples to better investigate the International Space Station's "microbiome," the ever-changing microbial environment that can be found on the Earth-orbiting facility and its crew members. On board the International Space Station, Expedition Six flight engineer Donald Pettit uses a chemical/microbial analysis bag to collect water samples from the Potable Water Heater in Russia's Zvezda Service Module. Despite an air purifier that cleans the module's air, and the astronauts' practice of wiping away dust with wet tissues before leaving, there could be unknown risks, according to Wang Xiang, chief commander of the space lab system. Microbes can pose a hazard to astronaut health, he told China Daily.